This is going to be a mix of a session report and review of the adventure. If you don't want to have the adventure spoiled, here's a quick summary: We had a lot of fun with all the zany things in this adventure. It's whimsical, wacky, and wild! I recommend you give it a shot. Now onto the section with spoilers! So the setup for this is that the PC's tribe and another tribe have an annual gift exchange they do to maintain the peace between the tribes. The gifts have been stolen and the PCs are sent to try to retrieve the gifts in time for the exchange. I modified that a bit to make it more en media res. My campaign has more of a "Umerican Survival Guide" setting so it's only been about 100 years since "The Great Disaster". Part of the joy of doing that is also setting the campaign where I live. So the gift exchange was between the Portland Oregon tribe and the Vancouver, Washington tribe on the remains of the I-5 bridge in the middle of the Columbia River. As the PCs (from the Vancouver tribe) were paddling their raft to the location, I had them witness the Portland tribe members flung off the bridge. Then, after the PCs climbed up to see what was going on, the thief (with a bag of Portland tribe gifts) used its rocket boosters to fly at them and take the Vancouver tribe's gifts too before flying off to Jantzen Beach. A pure strain human used a Legendary Deed to grab the thief as it flew but then failed another deed as it tried to maneuver so fell into the bushes on shore. The others rescued the fallen human and then followed the flying thief to an old Toys R Us building. There, they found the fun things found in the adventure such as smart wrapping paper and a stingbear. But that's just the first floor! 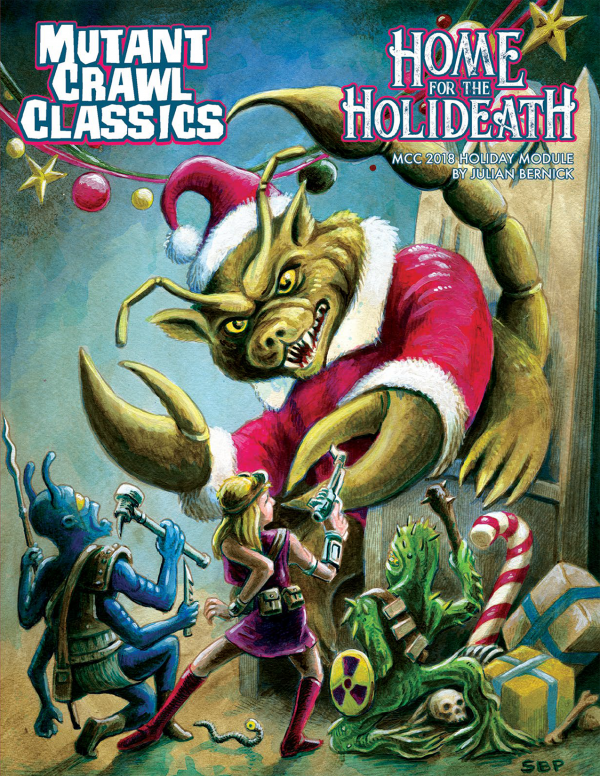 On the second floor, they found mutant rats and wooden soldiers (I changed the elves in the adventure to the rats from Nutcracker) and a crazy old toymaker along with a giant snowglobe. Then up to the final floor where they confront the A.I. named XMAS and a Christmas tree decorated with weaponized ornaments. But that's not all! After all of that, the PCs found the thief, a matronly maid robot who attempted to spank the naughty PCs (yes, that's in the adventure!) but had its eye stabbed, which initiated a self-destruct sequence (that was my addition). The PCs escaped with the gifts, the exchange happened, and everyone was happy. Next adventure will start on the road when the Vancouver tribe sends them north in a car! First, I'm only using two classes. I created a Pure Strain Human class that gets a Legendary Deed die that acts like the Mighty Deed die from Dungeon Crawl Classics and also gives bonuses to artifact checks. 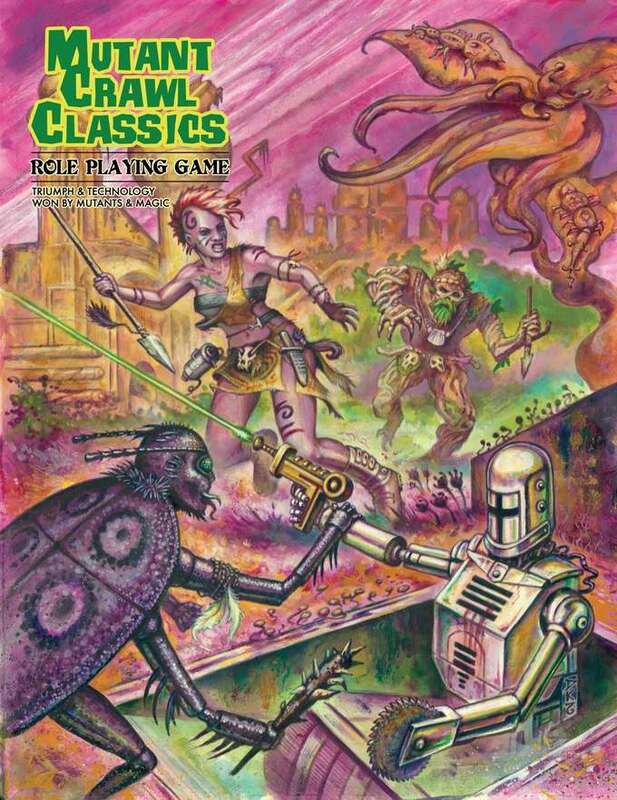 The other class is the Mutant/Manimal/Plantient class that gives 5 random mutations and lets players pick what kind of mutant they want to be. Second, I'm using the Umerican Survival Guide setting. Generally, that means I'm using the random occupations, equipment, and vehicle rules along with the whole zany near-future vibe of the setting. I started things off by showing a fan-made anime video for Weird Al Yankovic's Christmas At Ground Zero to get them in the mood and then started it off at level 1 with Home For The Holideath, which I will go over in my next post.